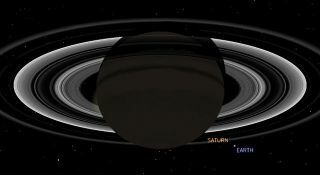 This simulated view from NASA's Cassini spacecraft shows the expected positions of Saturn and Earth on July 19, 2013, around the time Cassini will take Earth's picture. Cassini will be about 898 million miles (1.44 billion kilometers) away from Earth at the time. That distance is nearly 10 times the distance from the sun to Earth. UPDATE: The photos of Earth from Saturn by Cassini and from Mercury by Messenger were released Monday (July 22). See the amazing photos here. Nothing proves how fragile, beautiful and rare our planet is like a portrait of it taken from space. Now, scientists are planning to image Earth from a spacecraft stationed at Saturn, and are hoping many Earthlings will plan to stop and wave toward the ringed planet for the photo. NASA's Cassini probe has been orbiting Saturn for almost nine years, and has taken several portraits of our home planet. But the upcoming photo op will be the first time Earth's citizens have warning that their photo will be taken and can prepare accordingly, scientists say. The photo is scheduled to be snapped on July 19 between 5:27 and 5:42 p.m. EDT (2127 and 2142 GMT). Earth should be visible as a tiny dot next to Saturn and its rings, with North America and part of the Atlantic Ocean in sunlight at the time. In this photo by NASA's Cassini orbiter around Saturn, the planet Earth is visible as the small bright dot. 'While Earth will be only about a pixel in size from Cassini’s vantage point 898 million miles [1.44 billion kilometers] away, the Cassini team is looking forward to giving the world a chance to see what their home looks like from Saturn," Linda Spilker, Cassini project scientist at NASA’s Jet Propulsion Laboratory in Pasadena, Calif., said in a statement. "With this advance notice, we hope you'll join us in waving at Saturn from Earth, so we can commemorate this special opportunity." The Cassini team plans to take advantage of a rare total eclipse of the sun from Saturn on July 19, which will allow the spacecraft's sensitive cameras to turn toward Earth, which lies very close to the sun from its perspective, without getting damaged from our star's overwhelming light. "It will be a day for all the world to celebrate," Porco said. This narrow-angle color image of the Earth s a part of the first ever "portrait" of the solar system taken by Voyager 1. The spacecraft acquired a total of 60 frames for a mosaic of the solar system from a distance of more than 4 billion miles from Earth and about 32 degrees above the ecliptic. Image released Feb. 14, 1990. The first full-view photo of Earth from space was taken by the crew of the Apollo 17 mission as they traveled toward the moon on December 7, 1972. That photo, dubbed "The Blue Marble," was an instant classic. Another famous Earth portrait was the "Pale Blue Dot" shot captured by NASA's Voyager 1 probe in 1990 from a record distance of 3.7 billion miles (6 billion kilometers) away, beyond the orbit of Neptune. Cassini itself has already taken two photos of Earth from a distance, with its first, snapped in 2006, becoming one of the probe's most famous images ever. "Ever since we caught sight of the Earth among the rings of Saturn in September 2006 in a mosaic that has become one of Cassini's most beloved images, I have wanted to do it all over again, only better," Porco said. "And this time, I wanted to turn the entire event into an opportunity for everyone around the globe, at the same time, to savor the uniqueness of our beautiful blue-ocean planet and the preciousness of the life on it." Cassini launched in 1997 and arrived in orbit around Saturn in July 2004. It is slated to continue studying the solar system's ringed giant and its many enigmatic moons until 2017, when it will be sent on a controlled crash into Saturn's atmosphere. For updates on Cassini's Earth portrait plan, visit: http://saturn.jpl.nasa.gov/news/waveatsaturn/. North America and part of the Atlantic Ocean are expected to be illuminated when NASA's Cassini spacecraft takes a snapshot of Earth on July 19, 2013. This view is a close-up simulation.